The simplest way to understand closures is by realizing what problem they are trying to solve. Let's take a simple code example with a counter being incremented 3 times inside a loop. When the anonymous logging function gets executed, how can it have access to the variable 'i'? when the console.log statement gets executed, the closureExample function has long ended. So What is a Closure then? To solve this, the engine keeps a link to this variable for later use, and stores that link in a special function scoped execution context. Such a function with 'memory' about the environment where it was created is simply known as: a Closure. Why the name Closure then? Is there any way to See the Closure? 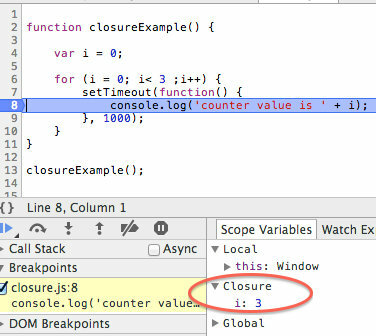 The simplest way is to use the Chrome Developer Tools debugger and set a breakpoint in line 7 of the code snippet above. As we can see, the closure is just a simple data structure with links to the variables that the function needs to 'remember', in this case the i variable. But then, where is the Pitfall? This is not a bug, it's the way closures work. The logging function is a closure (or has a closure, as the term is used in both ways) containing a reference to the i variable. the second timeout expires, and the logging function still logs 3, etc. How to have a different counter value per async operation? This works because when calling asyncOperation a copy is made of the counter value, and the logging will 'close over' that copied value. This means each invocation of the logging function will see a different variable with values 0, 1, 2. They can be a convenient way to reduce the number of parameters passed to a function. But beware of the pitfall: closures keep references and not copies (even of primitive values), so make sure that that is really the intended logic. Want to Get Started With Angular? Looking for Angular Learning Resources ?